Having provided the Waikato rural farming industry with electrical solutions for over 30 years, our team is familiar with the unique electrical needs of rural farms and is committed to ensuring that you get the right solution for your property. 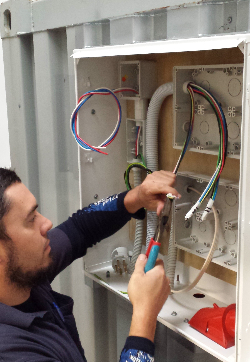 With an in-house team of dedicated and qualified registered electricians, we are able to respond quickly to any electrical or control system breakdown, 24 hours a day; 7 days a week, keeping your operations running without the need to rely upon sub-contractors who may have different sets of priorities. In conjunction with our pump and electrical operations, Professional Electrical Services Ltd and Professional Pump Services Ltd, our team at Professional Farm Services Ltd (PFS) use the latest available technology electronic control of pumps using flow, speed, level and pressure signals to perform a variety of pumping tasks, enabling cost savings for our customers in the installation and setup costs, as well as the ongoing running costs of the system.